Love love love this coat. It is lightweight but it kept me warm in Wisconsin. Highly recommend. HFX Halifax Olive Down Quilted Packable. Stand collar with attached coot, Long sleeves with thumb hole cuffs. Full zip front closures, Three zip pockets. Packable design, Down filling, Polyester. Machine Wash.
First, let me say the shipping was quick!! I mean like the next day!! When I received my package, I questioned what else did I buy from Overstock because it was so small. When I opened it, I definitely did not expect to see a coat! However, there it was, all nicely folded in a “no way there’s a coat in there” package. The coat is beautiful, very light weight and it feels good. I haven’t worn it yet due to the nice weather we are having right now but so far, I am happy with my purchase. 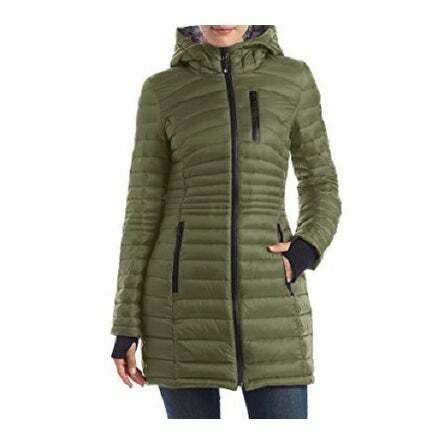 The coat was purchased for my daughter to replace a MK down coast that was stolen by former friend. With her being a label girl, I was concerned she wouldn't like it because of it being a label she had not heard of. When she received the coat, she immediately liked it. She really likes how stylish it looks - very feminine features PLUS she stated it was very warm for being so lightweight. Her only concern is she'd wished I purchased it one-size larger. Love the color, love the fit. Love the hidden pouch inside for turning it inside out into a pillow! Nicer coat than I expected. I love the color and it is made with real down on the inside. It also fits true to size. This is not a coat.Its a lightweight windbreaker. I purchased this for my daughter for snow weather. Very DISAPPOINTED.